The town of Marlinton sits along the Greenbrier River where it meets Knapps Creek, approximately 64 miles south of Elkins and 40 miles north of Lewisburg on US Route 219. The Seneca Trail, once known as the Great Indian Warpath, ran north and south along the Greenbrier River at this point, following the route that 219 currently takes in the area. This trail was a major part of the Indian trading and military network, connecting native tribes and nations from Alabama to New York. -Wills de Hass in History of the Early Settlement and Indian Wars of Western Virginia, 1851. By the time the first white settlers arrived in the Greenbrier River valley in 1749, the area had been seasonally occupied by Native American tribes for centuries. In the middle of the 18th century, it was the Shawnee, along with smaller Delaware and Mingo groups, who inhabited this valley in the warmer months of the year to hunt and fish. At this time, everything west of the Allegheny Mountains was considered the “western frontier,” an unexplored country of rugged, inhospitable terrain and hostile Indian tribes. Two enterprising adventurers, Jacob Marlin and Stephen Sewell, set out west from Frederick County, Virginia, in 1749. These pioneers reportedly “crossed the Allegheny range and followed a mountain stream through the pass north of Beaver Mountain to the mouth of Knapps Creek on the Greenbrier River.” There, they set up camp and became the first official white settlers west of the Allegheny Mountains, across the Continental Divide, to the “western waters” where rivers drained west to the Mississippi, as opposed to east to the Atlantic Ocean. The Greenbrier River near Marlinton. Not long afterwards, the two were followed by Col. Andrew Lewis, surveying land west of the Allegheny front for the Greenbrier Company. The English government had granted The Greenbrier Company the right to survey 100,000 acres of land, in which immigrants from the old country could settle. On October 6, 1751, Col. Lewis marked two great oak trees as a corner of his survey. These two trees became the “Corner Oaks” and stood marking the corner of Col. Lewis’ survey. 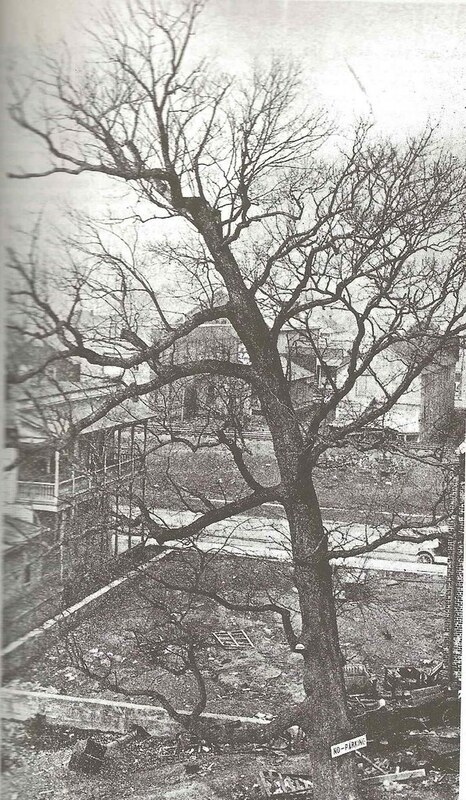 The Oaks stood in what became the town of Marlinton in the early part of the century, until one was cut down in the 1920s and the other died in the Great Drought of 1930. The stump of the second tree remained, standing about twelve feet high until it was removed in 1979. The corner oak in Marlinton stood until the 1980s. In 1755, Col. Andrew Lewis was ordered back to the frontier to build stockade forts on the Greenbrier River. This was the time of the French and Indian War, between the English and the French and their Native allies. The Seneca Trail, running through disputed territory, was deemed a priority, and the English decided to establish a military garrison to watch the trail against the Shawnees and other allies of the French. Thus was established Fort Greenbrier, supposedly built “near where the court house now stands” in Marlinton. Evidence suggests that Fort Greenbrier probably came into disuse around the time of the Revolutionary War, while other forts, like the one at Mill Point, continued to protect settlers from Indian raids. Colonel Andrew Lewis continued fighting Native American tribes, helping to open up the western frontier in western Virginia, and becoming famous for his role in the Battle of Point Pleasant in 1774. He took a command in the Continental Army as General Andrew Lewis during the Revolutionary War and was a founder of the city of Lewisburg, West Virginia, which was named after him.It has been recorded that in August of that same year, 1755, 18 settlers in the vicinity were killed by Indians in raids related to the French and Indian War. The British expedition under General Braddock to near the site of present day Pittsburgh had just been defeated, opening hostilities between Natives and settlers all along the frontier. It has also been reported that another Indian raid—and perhaps the last in the area—took place in 1779, killing 13 settlers and sending more into captivity. 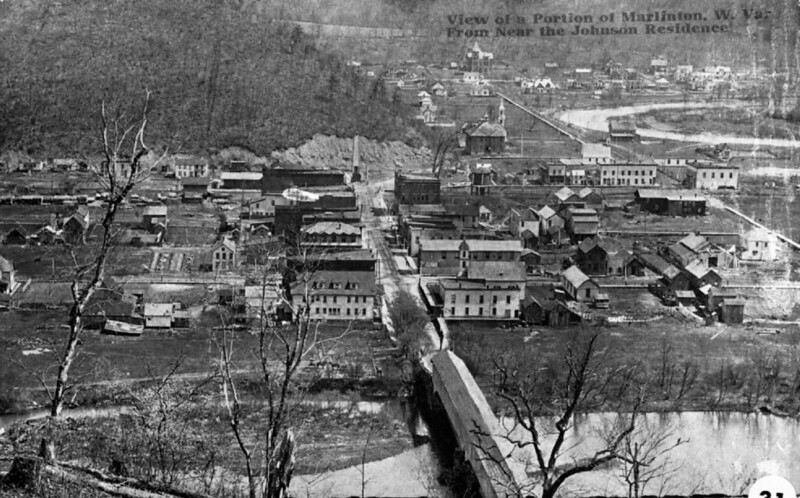 Marlinton was known as Marlin’s Bottom until 1886, when its name was changed to Marlinton. The development of the town was closely linked to the expanding railroad and timber industry in the area around the turn of the century. In 1890, John T. McGraw bought land in the area of the future town, which had been discussed as a logical location to build a Chesapeake & Ohio (C&O) Railway connection. At this point, Marlinton was not yet a town, but plans were laid out and it was advertised as “a place where a town would be built.” To entice the railroad connection to Marlinton, Mr. McGraw and the group of Marlinton investors promised $5,000 toward a new courthouse if the county would move the county seat from Huntersville to Marlinton. In 1891, Marlinton became the county seat of Pocahontas County and it was transferred from Huntersville, which protested the move. Marlinton, ca. 1910. Courtesy of the Pocahontas County Historical Society. After years of delays, the Greenbrier Divison of the C&O Railroad was constructed and operational around 1900, hauling lumber being cut by the Greenbrier River Lumber Company, which had invested in land in the Marlinton area in the 1890s. The town quickly grew after the coming of the railroad, as the timber industry in the county boomed. The population of Marlinton jumped from 171 in 1900 to 1,045 in 1910. The Pocahontas Times, which can still be found around the county today, moved from Huntersville and opened its offices in Marlinton. An Opera House–recently restored and hosting events today–was built in 1909. Marlinton also became home to numerous banks and a tannery, which was a major employer for decades. The Great Greenbrier River Race starts with a 5k run through town. Today, visitors can still see many of these historic sites around Marlinton. 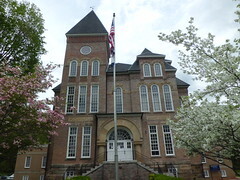 The County Court House, the Opera House, and the old Pocahontas Times Print Shop are on the National Register of Historic Places. The Pocahontas Times was the last known news publication to use handset type in the country, and the old print shop is now a museum. The Pocahontas County Historical Society also has a museum located in the Hunter House, that contains a vast collection of historical items and information on the history of the area. A small Confederate cemetery is also located on the museum’s grounds. The Greenbrier River Trail, a 78-mile long rail trail along the Greenbrier River, is one of the area’s big attractions that runs through Marlinton on the old tracks of the C&O Railroad. The town hosts the Greenbrier River Race every year, and popular town festivals include the Roadkill Cookoff, Pioneer Days, and an Autumn Harvest Festival. More information, and a calendar of events can be found at the Pocahontas County Visitors Bureau website: town.http://www.pocahontascountywv.com/. Sources: McNeel, William P. “Marlinton.” e-WV: The West Virginia Encyclopedia. 08 October 2010. Web. 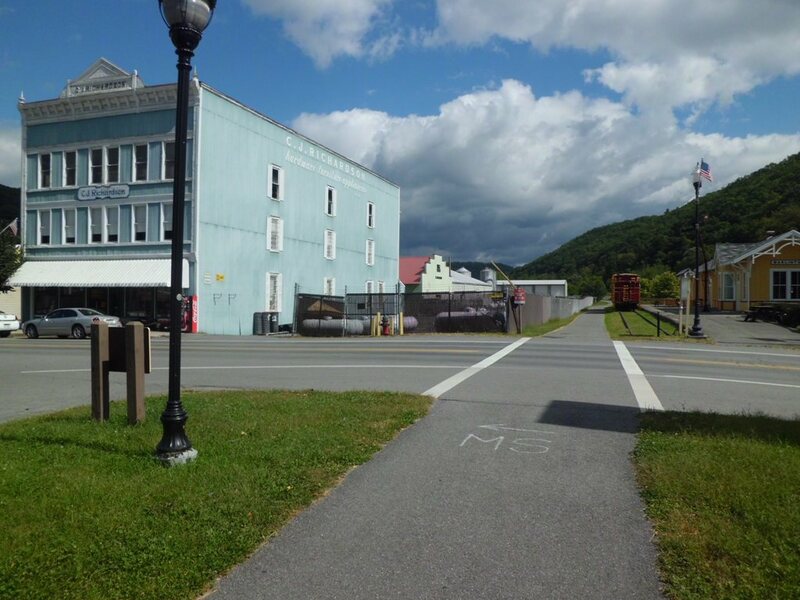 The Greenbrier River Trail goes through Marlinton next to the historic rail depot (right) and C.J. Richardson’s Store (left).